Once again, when you enter the dungeon your party is separated. Only this time, they're also trapped in separate rooms, and you need to figure out how to free them all. Basically you'll need to cycle through different party members, and place them on the appropriate diamond shaped tiles to open the way for everyone to reach the top of the screen. 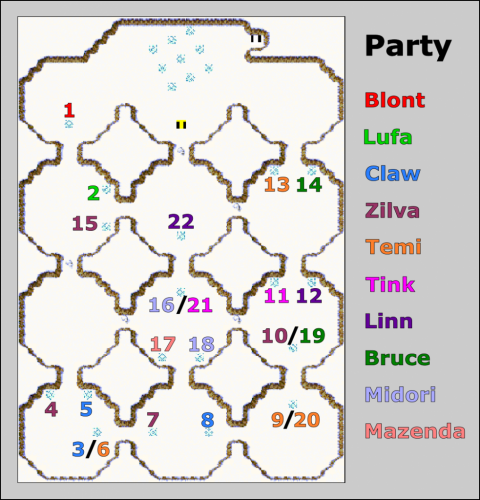 At the top of the screen you need to have 9 party members standing on the diamonds, so that the exit will open and the 10th party member can go on. Guide your party members to the appropriate spot by changing your formation. And then use Blont to go on to your next destination, which is the Arctic Region.